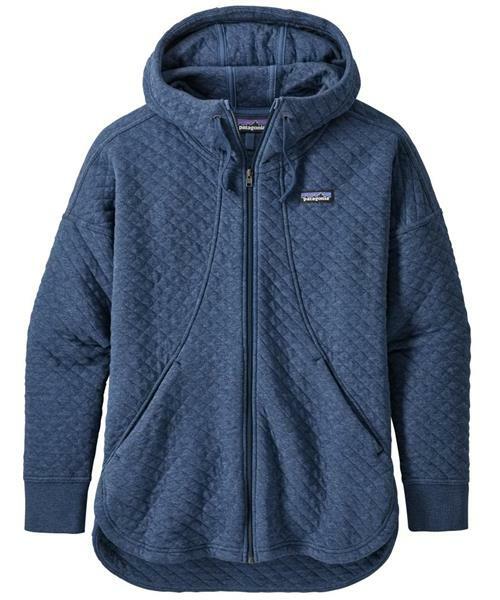 Patagonia's Cotton Quilt Hoody swaddles you in warmth on the way to and from the studio. Made from incredibly soft organic cotton/polyester jacquard knit fabric, the jacket has an oversized hood that keeps you cozy and has an easy-to-cinch, adjustable drawcord. Tall collar and center-zip closure guard warmth. Dolman-style sleeves with drop-shoulder detail and relaxed fit layer beautifully over workout clothes or tunic. Lined, drop-in, on-seam handwarmer pockets hold essentials. Scalloped hem, longer length and dropped tail provide full rear coverage. Rib-knit cuffs and hem provide shape and seal in warmth.